During the recent Midwest Regional Music Therapy Conference in Overland Park, Kansas I heard a wonderful case study using music to assist with bathing which I shared in my post “Reflections on Music Therapy Conference”. That has spurred me to think about how I have used music over the years in long-term care both as an activity staff member and as a music therapist . I have injected music into lots of events from horse racing to exercise to facility scabies scrub downs. As a music therapist, I know a ton of songs. That has worked to my advantage. Having the staff involved in the music improved the response by the residents. Staff musically interacting with residents can make for a home like atmosphere, a sense of genuine compassion, and an energized facility. It can make everyday duties like ADLs or waiting for a meal less taxing. Singing favorite songs for or with a resident dealing with a dementing diagnosis can sometimes increase responsiveness. Given the limited number of long-term care facilities which employ a music therapist or contract music therapy services, I thought it would be nice to share songs the staff could join residents in singing. Know that song preferences change with resident, locale and facility. With that in mind here is my Top Ten Songs to Know in Long-Term Care. Clementine – Folk song with chorus & verses. 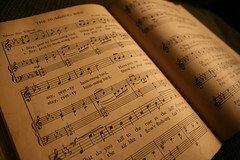 Songs with choruses allow for easier participation even if residents don’t remember the verses. Five Foot Two – This flapper song seems to get toes tapping and lots of facial expression whenever I use it. It is a great one for starting a talk about fashion. God Bless America – A patriotic number many older adults know well. Happy Birthday – Self explanatory, I hope! Let Me Call You Sweetheart – Old love song which can bring out waltzing type moves. You can also ask residents about other nicknames to substitute in the lyrics for sweetheart. Pack Up Your Troubles – While this WWI song seems too old, I find most people know it. She’ll Be Coming Round the Mountain – Another folk song that can easily be changed up. Take Me Out to the Ball Game – Men & women alike know this song. Singing in the Rain – A good one for showers and baths. I’m going to start with this list. You are very welcome. There is so much music to use. I love it when older adults ask me to find a favorite of theirs. It makes learning the song for that individual a personal experience for me.